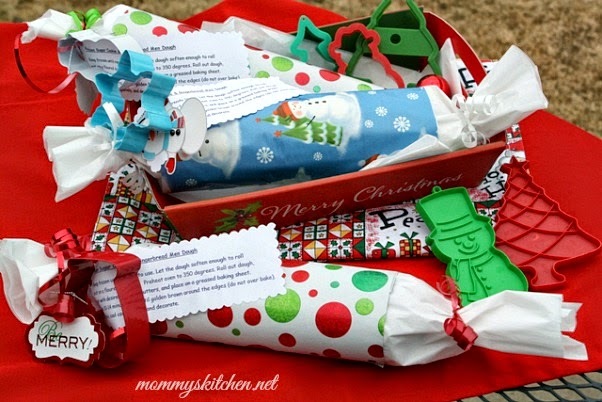 A creative and frugal way to wrap cookie dough for gift giving. Place the cookie dough rolls in a holiday basket or gift bag filled with holiday sprinkles and cookie cutters. Today I have a fun and yummy DIY Christmas gift idea to share with you. One of my favorite things to do every holiday season is give gifts from kitchen. It's so fun to present my family and friends with a treat trays filled with a variety of cookies and candies. This year Christmas is sneaking up on me pretty quick, so I don't have a whole lot of time for holiday baking. 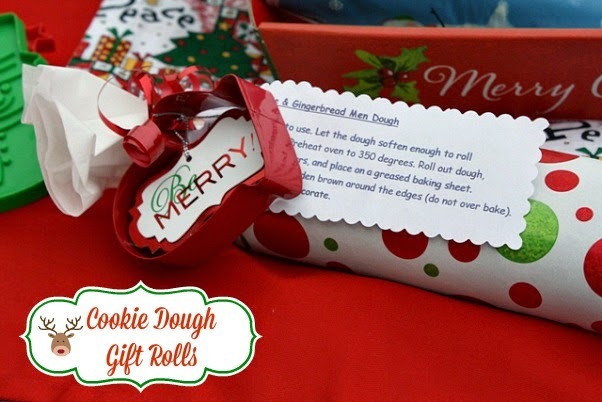 This year instead of baked cookies I think Cookie Dough Gift Rolls will be the perfect gift idea! Maybe you have a friend, family member, or neighbor that needs a little help in the kitchen this holiday season. With these cookie dough rolls, they can have cookies anytime they want. Plus who doesn't love cookies!!! Once the cookie dough rolls are complete all the gift recipient has to do is place the cookie dough in the freezer or refrigerator (for up to 3 days) and use whenever they choose. This is such an awesome holiday gift idea and time saver. This idea came to me when Walmart challenged me to create a Christmas craft or recipe. I chose to do a recipe, but also thought it would be fun to be creative and combine a recipe and craft together in one! I purchased everything I needed to make these fun cookie dough rolls at my local Walmart. You can use a homemade cookie dough of your choosing, store bought cookie dough rolls, or try this sugar recipe from Walmarts Baking Center. I chose to use my favorite sugar cookie dough, and a roll of store bought gingerbread cookie dough, but you can use whatever flavor cookie dough you like. Cookie Dough (recipe below) or use store bought cookie dough rolls, plastic wrap or large zip lock bags, parchment paper, assorted wrapping paper, clear tape, scissors, hole punch, cookie cutters, ribbon, holiday tags and printable recipe instruction tag. Start by preparing the cookie dough (recipe below). Place prepared or store bought cookie dough on plastic wrap and roll or place cookie dough in a large zip lock bag. I chilled the cookie dough a couple hours before wrapping so the dough wouldn't be so soft. Once the dough is chilled you are now ready to wrap the dough in parchment paper. Add a piece of tape to hold the parchment paper in place. Cut wrapping paper into desired length and place in the middle section of the dough roll (add clear tape to keep in place). Add ribbon to each end of the cookie rolls and tightly tie in place. Curl the ribbon using scissors for a festive look. Now it's time to add a holiday and instruction tag. 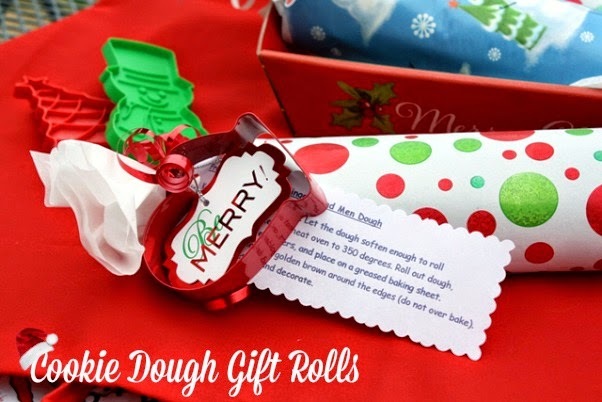 Print off these Cookie Dough Gift Roll Dough Tags, so the person you are gifting the cookie dough to has instructions for baking. I also chose some Holiday Time Snowman & Merry Christmas tags to add a festive look to my cookie gift dough. 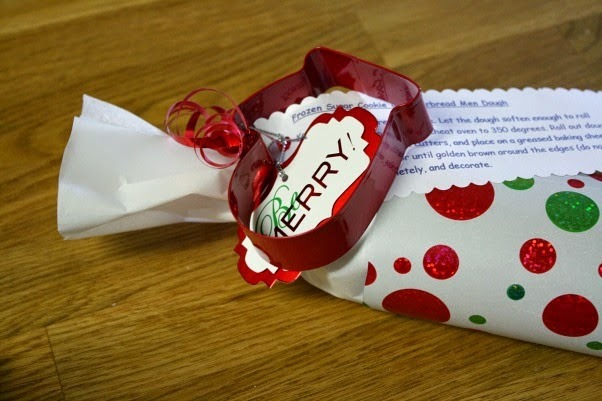 Add an additional piece of ribbon to one end and run a cookie cutter, holiday gift tag, and instructions tag (punch a hole in one end) through the ribbon. Tie tightly in place. Now your cookie dough rolls are ready for gift giving. You can place the cookie rolls in a decorative gift bag, holiday tray, or place them in a Christmas basket with a variety of holiday sprinkles and cookie cutters. 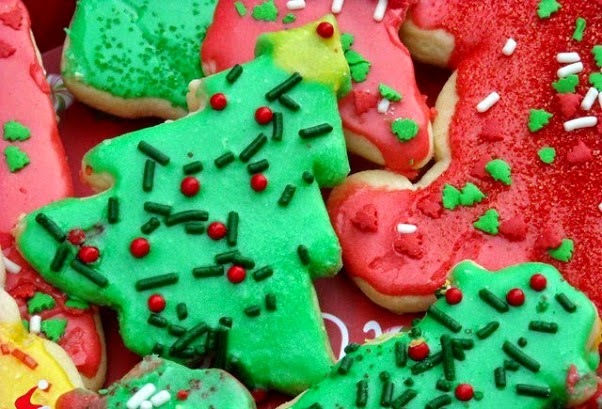 Christmas just isn't Christmas without a batch of decorated sugar cookies! In a medium size bowl beat shortening and butter together with an electric mixer. Add sugar, vanilla extract and beaten egg. Mix the flour, baking powder and salt together then add to the creamed mixture. Mix together scraping the sides of the bowl. I used my kitchen aid mixer to mix everything until it came away from the bowl and started to form into a ball. Try and mix enough of the flour mixture in using mixer, stir in any remaining flour with wooden spoon. Place dough inside a large zip lock bag and refrigerate for at least 2 hours. Bake at 375 degrees for 7-8 minutes or until edges are firm and start to get golden brown. The bottom of the cookies should be light brown as well. Let cool on baking sheet 5 minutes. Remove and place on a baking rack to cool completely. Frost with colored icing and decorate with sprinkles. I used three separate bowls to mix the icing. So one recipe for each bowl, mix all ingredients together with fork. If the icing is too dry, add a little more milk. Once mixed, add a few drops of food coloring or icing paste. Let the icing completely dry before storing cookies (about 3-4 hours). This post was sponsored by Walmart. All opinions stated above are my own. Great idea! Thank you for sharing. I wanted to know about how many cookies does this make with one of the cookie cutters you attach to it? Thanks. This is such a great idea! I am going to do this for our girls card game night . Perfect gift for the ladies. I don't know how many it makes with that exact cookie cutter, but this sugar cookie recipe yields about 2 dozen cookie depending on the size and thickness. Will this work with homemade chocolate chip cookie dough? Not for cut out cookies of course, but for wrapping? Yes this will work with any cookie dough. You would need to make a different tag to reflect your recipe and just leave off the cookie cutter. This is ABSOLUTELY BRILLANT and a very nice Xmas gift for all those people we appreciate for the "little things" in our lives..ie, co-workers, neighbors, delivery workers and other busy "mommies" getting every family ready for Christmas. the rolled cookie dough can be frozen. I think this is going to be a great "freezer" Christmas Present for me!! !